Elizabeth Burns: Welcome, Margo Rabb! The drawbacks of a blog tour: I cannot offer you a chair, or tea, or cookies. On the positive, you can pick your own comfy chair, have the tea and cookies of your own choice (or not,) and read this in your PJs and smile happily as you think about the traffic you avoided by going to the blog tour. And now, with drumroll, I give you: Margo Rabb! Liz B: "Don't judge a book by it's cover" is one of those lies people tell. 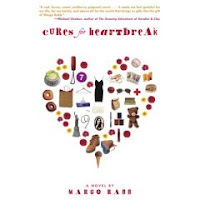 Covers do matter; and "Cures for Heartbreak" has a fabulous cover. How excited were you when you saw it? Did you have any input into the creative process or the selection? I know I've spent way too much time looking at all the images to figure out how they fit into the story. Margo: Actually, the current cover isn’t the original one—neither my agent nor I felt the first cover design was right for the book. My editor came up with the idea for the current cover, and when I saw it I absolutely loved it. I’ve heard that lot of authors don’t get any say in their covers—I was lucky. Liz B: Parts of Cures for Heartbreak appeared as short stories in various magazines. And your Afterword to the book said that this book was several years in the making. I'm curious; did the short stories come first, and then the book? What was the writing process that led to both the book and the stories? Margo: The stories came first, though I revised them all heavily over many years so that they’d fit together as a novel. Five chapters were written within the space of a few years, from 1996-1999. I revised them and then I put the draft of the book aside for a number of years (I talk about why on my website here: http://www.margorabb.com/about_cures.html ) I also wrote a number of other stories featuring Mia, Alex and their father, which I decided weren’t very good and so I threw them out. I wrote The Healthy Heart and the Cures for Heartbreak chapters last. Liz B: Cures for Heartbreak is based on your own personal story; but it's a work of fiction, not a memoir. What led you to tell your story as a work of fiction? Margo: There’s a Tuscan proverb I have pinned above my desk: “A tale is not beautiful if nothing is added to it.” Writing nonfiction doesn’t usually give me anywhere near as much pleasure as writing fiction, because it’s the creative process of writing fiction that’s magical for me--imagining people, places, and conversations, letting the story take over with its revelations and surprises--which makes writing really enjoyable. Also, I feel like I can be more truthful in fiction—to get at the real heart and meaning of an experience is easier when I don’t have to stick to the facts. Liz B: I totally didn't know you were also M.E. 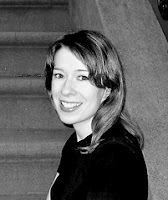 Rabb, author of YA mysteries (the "missing persons" series.) I love that series! What led you to decide to publish under different names? Margo: Gilmore Girls! I’ve been a huge fan of Gilmore Girls since its first season—in fact I have a secret fantasy (well, not so secret anymore) of living in Stars Hollow and hanging out at Luke’s diner every day. My husband of course reminds me that Stars Hollow is located in a lot at the CW network in Burbank, California. Still…I keep dreaming. Thanks for the interview - I just strated reading Cures for a Heartbreak and LOVE IT! and I too would love to live in Stars Hollow! Great interview, Liz and Margo! This is why I love this world - Buffy, GG, Veronica Mars, teen lit. What more could a girl want? Great stuff! Love the Gilmore Girls reference. I adore Luke's diner. Liz, thanks so much for hosting me! Kathy, I'm so glad you're enjoying the book. See you all at Luke's!